Students expected to graduate from a certified Rhode Island high school in June 2018 are eligible to apply. Completed applications must be received by August 1, 2018. The $2,500 scholarship is jointly funded by the AFP-RI Chapter and Herb’s wife, Christine Townsend. 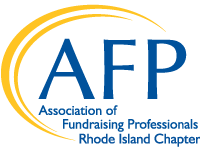 The $2,500 scholarship will be awarded on November 16, 2018, during the AFP-RI Chapter National Philanthropy Day celebration. The award winner must use the scholarship for higher education by June 30, 2019.